Well I’m thrilled to report that our living room no longer looks like a little boy’s nursery! I admit to feeling pretty defeated when I realized just how wrong the color was. Repainting meant not only that the house would stay in a state of chaos for longer, or that I had hours and hours of work ahead of me, but also that I had to find a new color – and that this time I better get it right. My spirits were low and my confidence was shot, but I had to gird my loins and do the paint sample parade again. Fast forward through some real anxiety, many a text and photo sent to Mera, a cricked neck from all the ceiling edges, and two complete audio books plus innumerable podcasts, and it’s done! And… I love it! The color is luminous, the room is much brighter, and it does not – in any light – read nursery. The name of the paint is – with no shortage of irony – Crystal Ball. If only I’d had one, I could have saved myself a lot of heartbreak. It’s from Miller Paint in their Evolution line (the same paint I used and loved in our dining room) and was actually a color I initially considered for the space before I succumbed to the expert advertising of Farrow & Ball. Its name may not evoke the soot-blackened walls of a cottage nestled in the English countryside, but it sure is pretty. We’ve put a few things back into the room, but it’s mostly still a blank slate. It’s nice to take a little time to think about where art and furniture will go, and it feels wonderful to be liberated from the green paint that was in here – there’s so much more potential to bring color and pattern into the room now. 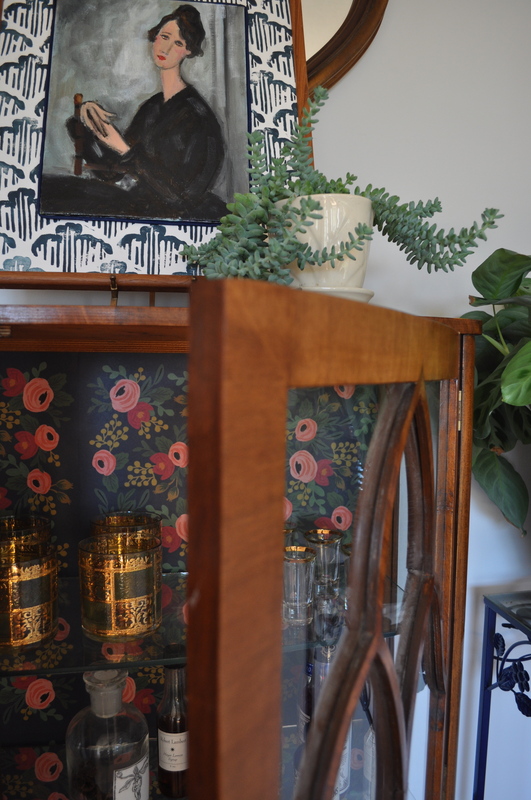 This week I decided to spruce up the booze hutch, an antique British cabinet that Cameron and I bought at a thrift store soon after we moved in. As the name implies, we use it to store our hooch and glassware. 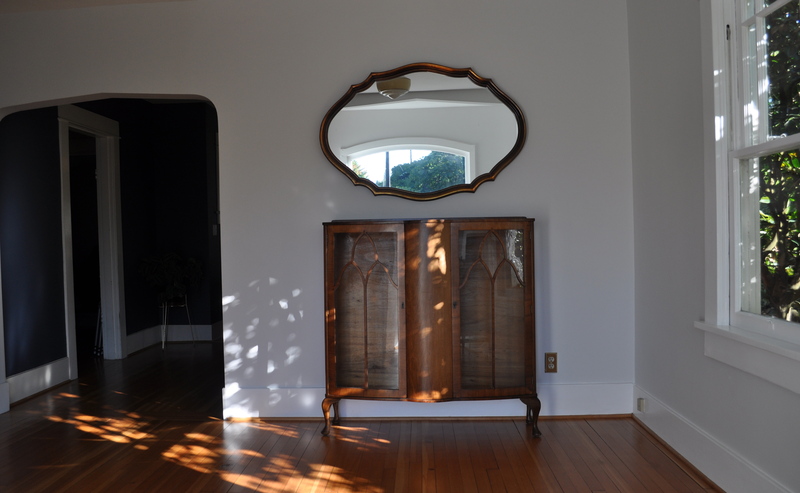 It’s a pretty piece, and its curves are a nice counterpoint to the mid-century modern furniture also in this room. There’s an awful lot of wood in this space though, and this seemed like a good opportunity to dress it up a bit. I am crazy for Rifle Paper Co.’s wallpapers and would love to paper my whole house in them, but for now I thought I’d do something smaller scale and a whole lot less expensive. 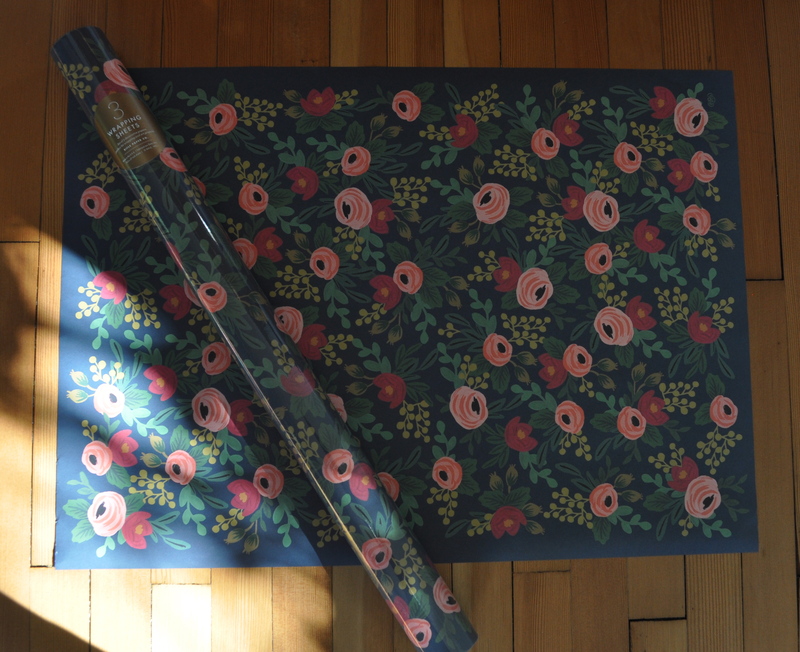 This Rifle Paper Co. gift wrap is $8.50 for three sheets (and it only took three to paper the hutch). There are lots of pretty patterns, but I couldn’t say no to the colors of this one. It might be a wee bit feminine, but I figure that it’s just a small space, and it will be partially obscured by booze which is totally gender neutral, so it’s okay. I didn’t want to permanently adhere the paper to the hutch so I decided to just use double-sided tape. This way, when its tenure as a backdrop for spirits is up, I can still use it for something else. So there you have it! Almost two weeks of blood, sweat and painting-related angst plus one easy update distilled into one short post! I’ll show you more of the room (and no doubt solicit your opinions) as I start to move more things back in. Thanks for reading along and make sure to check in on Friday! Lovely. 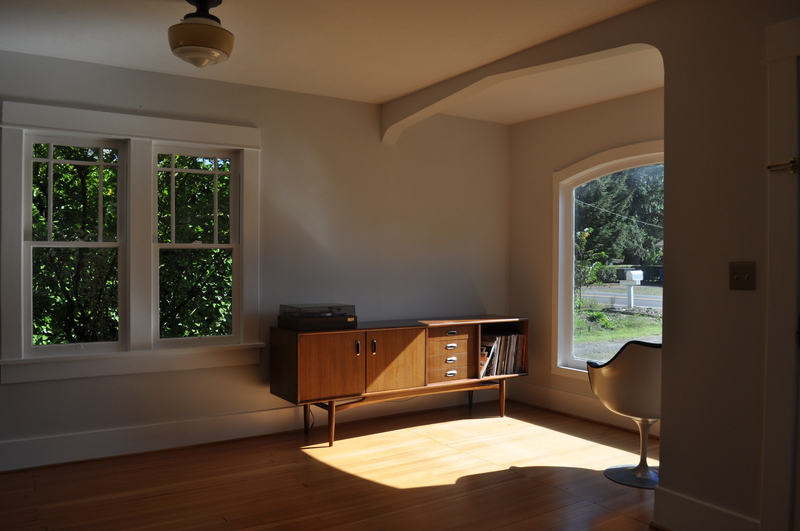 That paint color looks perfect and I love what you did with the hootch hutch. Is that a Modigliani print? Dreamy. Thanks Nina! And good eye – It’s actually a little oil “in the Modigliani style” that I got on eBay. Love those elongated necks! It was worth it Mar – thank goodness! The brightness is making me happy, and I know I’ll definitely appreciate it when winter sets in. xoxo. Gosh, those shallow, blue-toned glasses are pretty! Where ever did you find them? Ha! Family heirloom, now properly displayed. Bravo Katie—it looks perfect! I so admire your perseverance. 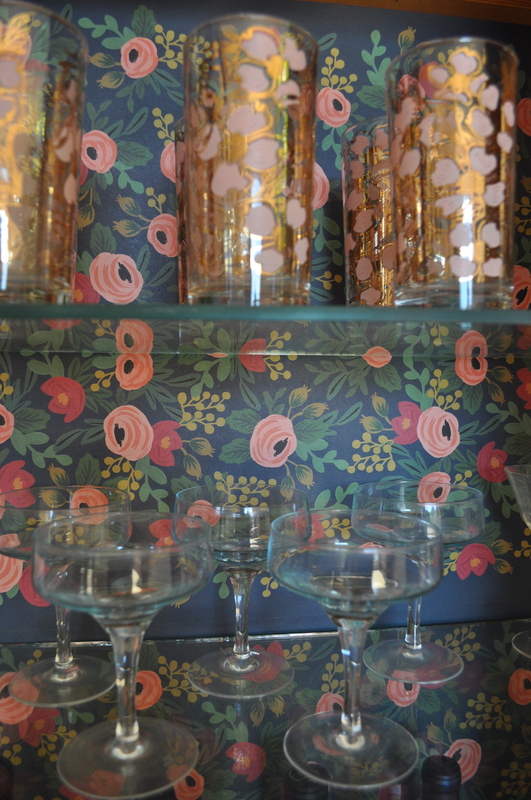 And the cabinet—the perfect follow-up to Monday’s Florals post. 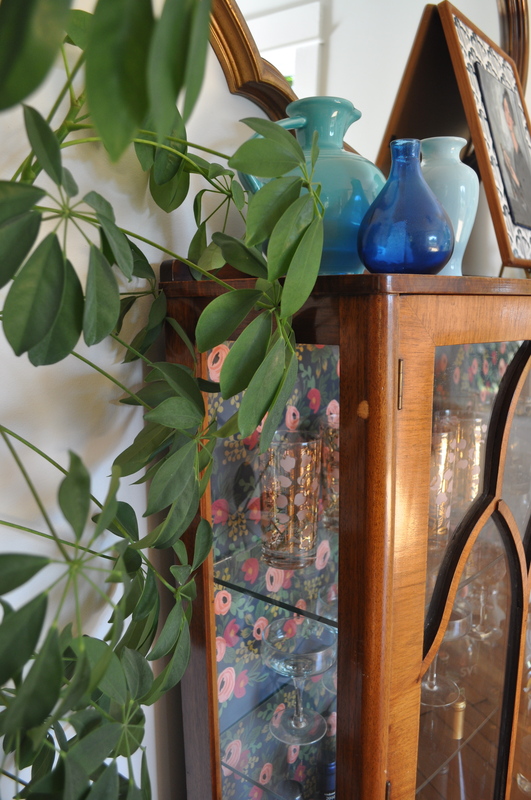 You’ve inspired me to take a look at a wooden cabinet I have my glassware displayed (more like stored) in. Thanks so much! Thanks Michelle! It was persevere or perish 🙂 I’m definitely into florals right now, and it was fun to find a little way to add pattern into the space. The post we’ve been waiting for – the paint dilemma solved, and solved so elegantly. 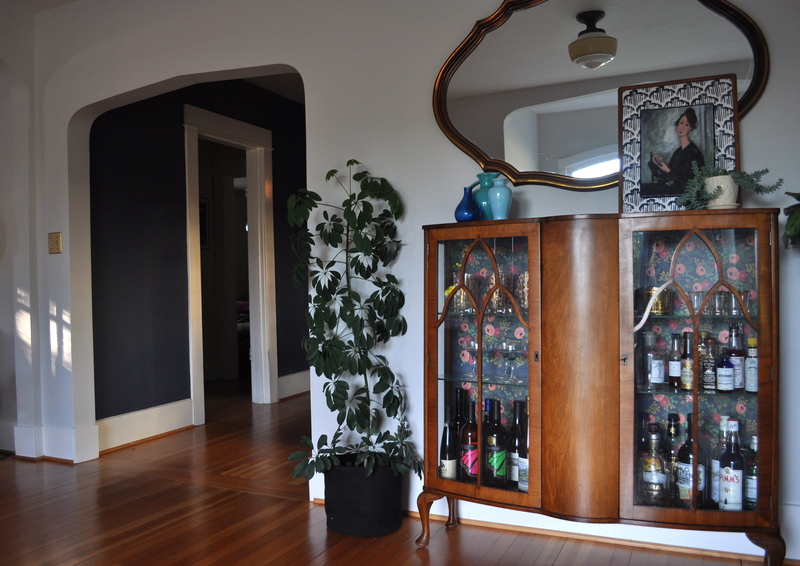 Because it does look elegant in there with the curvy hutch and curvy mirror and the curvy woman in the painting. And what a super idea to put that paper in the hutch. Now here are florals that really work! Oh looks so good Katie – I hope you are really proud each time you walk by that lovely room! And thank you for loving florals – they seem to fit beautifully into your house. That’s clever, about the paper, such beautiful gorgeous wrapping paper always seems to want a real use. Thanks for the idea! I’ve been spending a lot of time in that room since painting it. It’s so much nicer in there. And I am definitely crazy for florals!